If you're stuck between settling for drab vocals or dishing our serious cash for a massive vocal processor, then you're going to love the BOSS VE-1 Vocal Echo. The VE-1 packs awesome echoes, studio-style processing, and essential effects all into a compact, portable, and battery-powered (optional AC adapter available) module you can take anywhere. Let's take it from the top. In all, the VE-1 gives you seven echo settings ranging from subtle to deep and lush. For a touch of studio polish, just hit the VE-1's Enhance button, or hit it twice for a bit of subtle automatic pitch correction that smooths out your voice and your harmonies. Top it off with a cool double-tracking effect and tone shaping, and you're golden. 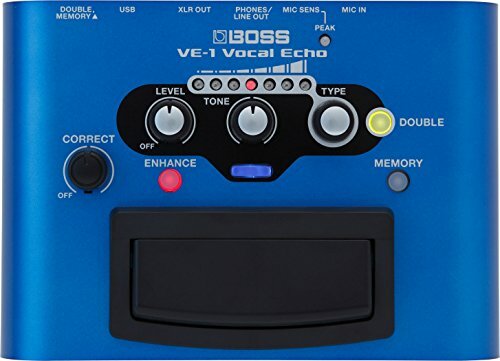 And as an added bonus, the BOSS VE-1 Vocal Echo even includes USB connectivity, so you can use it with your favorite DAW in the studio too.